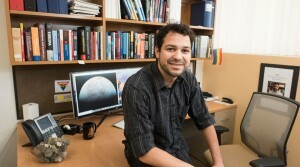 A team of NASA scientists that includes CSUN astronomy professor Wladimir Lyra, has discovered evidence that disk patterns, often indicators of the formation of new planets, can form on their own. Image courtesy of NASA. Peering far out into the universe, astronomers and astrophysicists look for markers — indicators such as patterns in disks of dust — that might indicate the formation of new planets. Recently, however, a team of NASA scientists that includes California State University, Northridge astronomy professor Wladimir Lyra, has discovered evidence that these disk patterns can form on their own, fed by gas and dust, without the presence of planets. Alexander Richert, a doctoral student at Penn State University, is the lead author on the new study, which builds on previous simulations created by Lyra and Marc Kuchner, an astrophysicist at NASA’s Goddard Space Flight Center in Maryland. Kuchner presented the findings of the new study on Jan. 11 at the American Astronomical Society meeting in Washington, D.C. The study includes a new factor in disk pattern formation: radiation pressure created by starlight. “We’re exploring what we think is the leading alternative contender to the planet hypothesis, which is that there’s an instability in the gas and the dust that makes a disk naturally form the patterns,” Kuchner said. The instability occurs when high-energy ultraviolet starlight strips electrons from clumps of dust grains. Those electrons collide with and heat nearby gas. As the gas warms, pressure increases and traps more dust, which in turn heats more gas. Lyra and his collaborators called the resulting cycle photoelectric instability (PeI). Simulations created by Richert, Lyra and Kuchner show it can eventually create some of the patterns associated with planets. Exoplanet hunters watch stars for a few key signs that there might be planets in orbit, such as changes in the color and brightness of the starlight. For young stars, which are often surrounded by disks of dust and gas, scientists look for patterns in the debris that might be caused by an orbiting world, such as rings, arcs and spirals. “Carl Sagan used to say, ‘Extraordinary claims require extraordinary evidence,’” Lyra said. “I feel we are sometimes too quick to jump to the idea that the structures we see are caused by planets. That is what I consider an extraordinary claim. We need to rule out everything else before we claim that. Lyra and Richert began their collaboration in 2013 while Lyra was a postdoctoral scholar at JPL. Later that year, Lyra and Kuchner found that PeI could explain the rings seen in disks. The researchers modeled how radiation pressure and PeI can affect the movement of dust and gas when working in tandem. They found that the way PeI manifests in different patterns also depends on the physical properties of the dust and gas. 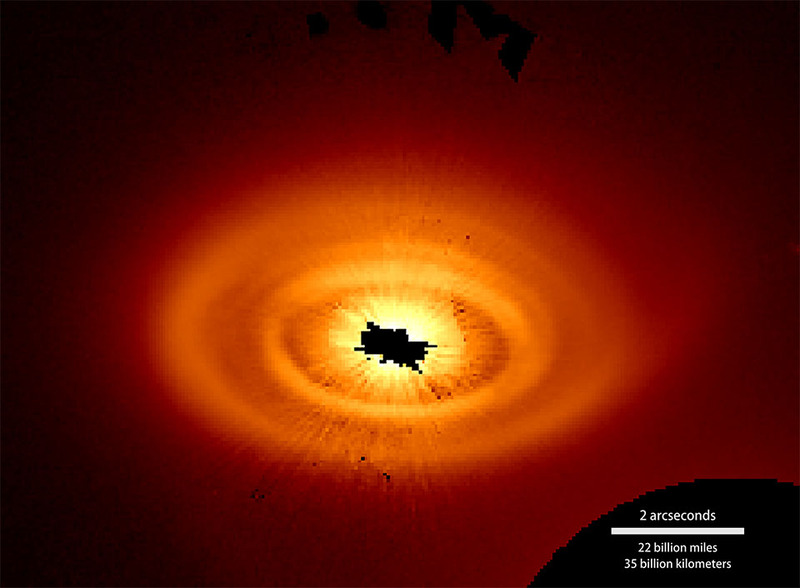 The 2013 simulations of PeI explained how dust and gas can interact to create rings and arcs, such as those observed around the star HD 1414569A. By including radiation pressure, the team’s 2017 models show how these two factors can create spirals like the ones observed around the same star. “We are advancing the goal of turning these observations into probes [for] planets,” Lyra said. “We are also helping to find planets, because we are improving on our theoretical understanding — to finding planets and isolating planet signatures from the noise. Lyra, Kuchner and Richert said that next, they hope to factor in other variables in their simulations, such as turbulence and different types of dust and gas, as well as how those factors might contribute to pattern formation around different types of stars. Lyra noted that one of his graduate students at CSUN is working on these models, exploring what happens when a gas planet interacts with dust. “This has been very rewarding, because we are [building] a theory from scratch,” Lyra said of the work with his student researchers and NASA colleagues. “Sometimes we find something entirely new. With the rings, it was exactly that.